After many months of work, the 5th edition of the Sybex Publishing Certified Wireless Network Administrator (CWNA) Study Guide is available. Writing a book is a time-consuming and often aggravating process. However, whenever the finished edition arrives at my doorstep, I always react like Steve Martin does in this movie clip. The CWNA book is a 1024-page Wi-Fi novel with a vendor-neutral viewpoint. The CWNA paperback is available at Amazon and other online retailers. The Kindle edition and other digital formats are also available. The first edition of the CWNA Study Guide hit the shelves in 2006. As an author, I am always struck by how much the written word can be improved after the passage of time. Therefore, the entire book was updated with a fresh perspective. The book has been completely overhauled with many of the existing chapters re-arranged into a more logical order. Because 802.11 technology changes so fast, multiple chapters required an extensive rework, including Chapter 9, 802.11 MAC, and Chapter 14, WLAN Site Surveys. The book offers a new chapter about WLAN Troubleshooting and a much-revised chapter about 802.11 Medium Access. For those of you who have already taken advantage of the free download of Aerohive’s “802.11ax for Dummies” booklet, there is also a very detailed chapter about 802.11ax high efficiency. If you assemble 200 Wi-Fi experts in one room, such as the WLAN Professionals conference, most likely you will get 200 different opinions as to proper WLAN design for coverage, capacity, and airtime consumption. That being stated, one of the best new chapters in the book is Chapter 13, WLAN Design Concepts. We cover WLAN coverage, capacity, and integration design aspects from a conceptual basis. Why is the CWNA study guide important? Twenty years ago, most networking professionals were new to Wi-Fi, therefore the need to educate themselves about 802.11 technology was apparent. The CWNP program has long provided the foundation for networking professionals to pursue WLAN education. The beauty of the CWNP program is the vendor-neutral approach towards education about 802.11 technology. Most of Aerohive’s competitors recommend CWNA as a prerequisite for their own internal training classes, as does Aerohive. I would like to personally thank my very good friend and co-author, Dave Westcott. David Westcott, CWNE #7, is an independent consultant with whom I have now written eight books. 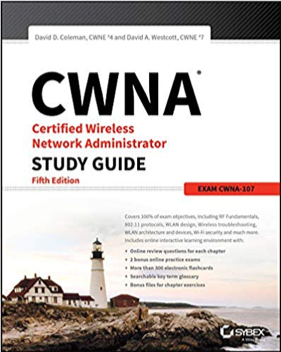 As authors, we have been humbled by the thousands of individuals who have purchased previous editions of the CWNA Study Guide to assist in their pursuit of the CWNA certification. We are also humbled that many universities and colleges have selected the book as part of their curriculum for wireless technology classes. In our travels, we have met many of our readers of previous editions of the book. We discovered that a large number of people who purchase the book use it as a reference guide in the workplace and not just as a study guide. I also need to give a big shout-out to our technical editor, Ben Wilson. His Wi-Fi background and knowledge were invaluable in providing the amazing technical editing that this book deserved. And finally, thanks and a big 4-Way Handshake to Chuck Lucaszweski, CWNE #112, for his very gracious forward.